Deciding on my Book of the Month was a relatively easy task this time around, as I narrowed it down to two books pretty quickly - Mark Walden's Rogue and Jenna Burtenshaw's Wintercraft. I have been a huge fan of Walden's H.I.V.E. books ever since I read the first in the series, but I have decided to choose Ms Burtenshaw's novel as my May Book of the Month, as it is a remarkable debut fantasy story. As I said in my original review, I loved this dark fantasy story with its well imagined world of Albion and its cast of colourful characters. It would seem I am not alone in this, as since its released it has continued to garner good review after good review. Some reviewers have offered their criticisms but even these admit that the quality of writing, the world building and the characters overshadow any perceived weaknesses. Fantasy is not a genre that I have warmed to over the years - too many fairies, dragons, etc. for my liking - but this book had me captivated from start to finish (possibly aided by the total absence of any of these aforementioned mythical creatures). It is also evident that I am not the only reader who thinks that Silas Dane is the stand out element of the story. Yesterday on Twitter Ms Burtenshaw mentioned that the next adventure set in this world should be out next spring, and that "there's lots more to come from Silas and Kate" - fantastic news! Carter and Sadie have nothing in common but their parents: their father Dr. Julius Kane, a brilliant Egyptologist, and their mother, a famed archaeologist who died under mysterious circumstances when they were young. The siblings barely know each other, but one night, their father brings them together at the British Museum, promising a ‘research experiment’ that will set things right for their family. His plans go horribly wrong. An explosion unleashes an ancient evil – the Egyptian god Set who banishes Dr. Kane to oblivion and forces the children to flee for their lives. Now orphaned, Carter and Sadie must embark on a dangerous quest – from Cairo to Paris to the American Southwest, to save their father and stop Set from destroying everything they care about . . .
As a child I had quite a collection of Ladybird Books, as did many other kids who grew up during the 70s, and my favourites were the two Famous Legends books which included the stories of Theseus and Perseus. I have harboured this interest ever since and loved Rick Riordan's Percy Jackson series, both for the clever way in which he brought those classic myths into the 21st Century and also for the way in which, through the Percy books, he ignited an interest in these myths for a new generation of kids. As I grew up I developed an interest in the mythologies of other cultures, and especially in those of the Ancient Egyptians. I have been lucky enough to spend a few weeks travelling in Egypt, and last year took my very excited godson, who also shares this interest, to the Tutankhamun exhibition when it came to London. I have therefore been looking forward to reading Rick Riordan's The Red Pyramid ever since I first heard about it back in October of last year. So, did it meet my expectations? I wish the answer was a straightforward yes, but it isn't. However, it is also not a no either. Don't get me wrong, on balance I enjoyed it but it is flawed in several ways that disappointed me. First of, unlike the Percy Jackson series, this took me longer than usual to get into. I think this was because of the way the story is told, in the form of a first person narration by the two main characters, Carter and Sadie Kane, alternating every couple of chapters (supposedly they are recording their story for others to discover). At first I found this a little irritating, although I eventually got used to it (although I'm not sure I needed the supposedly humorous asides that were occasionally slotted in). I also have to admit that I found it a little confusing at times and had to double-check who was narrating from time to time (the publishers made this easy for me by having the name of the narrator at the top of each odd-numbered page), and for me this is a weakness in the author's ability to give his characters individual and distinct voices - Carter and Sadie just 'sound' far too similar, even though one of them has grown up travelling the world with his father and the other has lived a far more normal life with her grandparents in London (and despite this she often doesn't 'sound' British at all). This way of telling the story leads sraight on to my second moan - there are a number of times throughout the book where a particular incident is told from one character's point of view, and then subsequently retold by the other character when it is their turn to narrate. The consequences of this are that a) the pace of what would otherwise be a very fast-paced plot from beginning to end is affected and b) the book ends up being much longer than it needed to be. In fact, some readers may be deterred from even picking up this book as it weighs in at a mighty 514 pages. OK... that's my moans taken care of so what elements of the book did I enjoy? Well first of all the 500+ pages are not solely due to the irritating retelling of scenes - as the first book in a new series there has to be a large amount of setting up take place and I believe that Rick Riordan does this pretty well. I think this was easier for him in the Percy Jackson series as the concept of ancient Greek Gods having modern-day offspring was more straightforward. 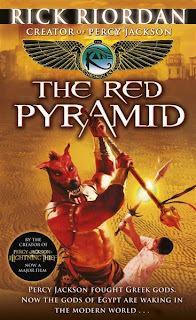 In The Red Pyramid Carter and Sadie are not gods or even demi-gods, they are just normal kids who happen to be descended from the pharoahs of ancient Egypt. This requires a lot of necessary history telling and world building as the two siblings slowly discover that their lives are far from ordinary. I also loved the way Rick Riordan built the mythology of Ancient Egypt into this modern tale - this man really knows his stuff! Some might say that he is just repeating a formula that he has already proved to be successful, but this is certainly no Percy Jackson copy. Egyptian mythology is far more complicated than the Greek tales and also far less well known (Mummy movies aside it has been represented on the big screen far fewer times) and this creates quite a task for the author. Just read this short piece on Wikipedia about Osiris and you will see what I mean about complicated. However, as I said, Rick Riordan knows his material and his passion for this mythology really shines through, just as it did in the Percy Jackson series, and this will give the inquisitive minds of his young (and old) readers to further investigate and learn about these ancient stories (I have spent a good few hours reading up on the likes of Isis, Horus and Set since I finished the book). Despite my previous moans and all this plot setting, world building and myth telling the story is still pretty fast paced with the siblings going from one life threatening escapade to the next, sometimes with little time for the reader to get his/her breath back. Rick Riordan has already proven his story telling abilities in the past, and despite its faults this is still an exciting adventure story with plot twists, great battle scenes and engaging characters (including a basketball loving baboon called Khufu). Yes, I was a little disappointed with it, but the Percy Jackson series is a high standard against which to compare this book, and even with the faults it is still a lot better than many books on the market for the 9+ age group. And this disappointment does not mean that I am not already looking forward to the next in the series; in actual fact I am really excited about continuing with this series in the future as I feel that now the scene has been set and the characters established we will see more of the Rick Riordan storytelling that we have come to know and love. Initially Mr Riordan stated that The Red Pyramid would be the first book in the Kane Chronicles trilogy, although he also said that given the opportunity he may take the story further than this. If this is the case and the books are all this thick then I just may have to invest in a new set of bookshelves to make room for them. The Red Pyramid is published in the UK by Puffin, who very kindly sent me this copy to review, and is available to buy right now. You can find out more about the book and the mythology behind it at the official Kane Chronicles website. Well done and thank you to everyone who entered. I will now endeavour to contact the winners through twitter. Please reply within 48 hours or I will draw another name out of the hat. Many thanks to Macmillan for providing this fabulous prize. I have been a little too busy recently to keep up with what has been happening on the other blogs that I follow. Yesterday I found myself with a few minutes to spare so I headed on over to My Favourite Books, only to find that they were having a Viking themed week. 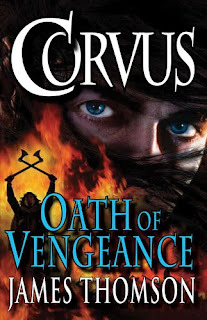 Coincidentally I have not long finished Corvus: Oath of Vengeance by James Thomson - an epic and bloody Viking tale that I feel will have massive appeal to boys of 11 and older. So, I offered my services to Liz over at MFB and my review is now live. Head on over there to find out more about Corvus and his Viking adventures. So much for me having a fortnight focusing on mystery stories - sometimes life has to take over and one of the things that suffered was the Book Zone. Hopefully normal service will be resumed as soon as possible but in the meantime I wanted to mention this cracking book that the kind people at Piccadilly Press sent me. 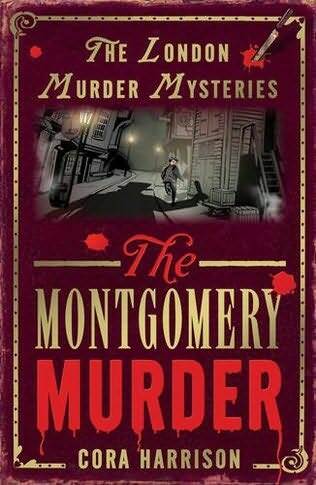 It is called The Montgomery Murder, and is the first in the new The London Murder Mysteries series from Cora Harrison. This is the first book I have read by Cora although I understand she has already written a number of books for children. This one, however, grabbed my attention as soon as I read about it as it is set in the Victorian era (one of my favourite periods in history) and in London (my favourite city - readers will know I love books set here). I found the book a hugely enjoyable read, and ppolished it off in one sitting. It is very much in a similar vein to Anthony Read's Baker Street Boys series, but instead being assisting Sherlock Holmes, Alfie (and his band of waifs and strays) are 'enlisted' by Inspector Denham of London's finest. The premise therefore is not a particularly original one, but this is certainly not something that should deter you from reading this book. Alfie lives with his blind brother Sammy, his cousins Jack and Tom, and their dog Mutsy in a cellar which had been the home of Alfie's parents before they died. Since then the boys have been living any which way they can in order to scrape enough money together to pay the weekly rent and keep them all fed. Sometimes this means a spot of petty thievery, and it is during one of these less than legal activities that Alfie is collared by the cops and finds himself hauled in to Bow Street Police Station. For Inspector Denham, who is currently puzzling over the murder of a wealthy local gentleman, the timing couldn't have been better and he soon has Alfie working for him in return for his freedom and a possible share in the reward money. Cue a series of perilous experiences for Alfie and the boys and they launch their own investigation, aided by Mallesh, an Indian boy who is also the police's prime suspect. These investigations are not your average Famous Five style adventures - these kids are in genuine peril, and at least one of them gets seriously hurt in the process. The blurb on the back cover calls it an "action-packed adventure" and they certainly aren't wrong. It is a relatively easy read and would suit both confident readers of 8 or 9+, as well as older chidlren who maybe struggle a little more with their reading. The caracters are placed in some life-threatenign situations but there is nothing too scary in the plot. I was a lover of mystery stories when I was younger and I would have lapped this up. The characters are fun, brave and resilient - and stick together, despite their unfortunate circumstances. Alfie is a strong leader of the group, taking it on himself to ensure that they are well provided for, even at his relatively young age. His protective nature towards his blind brother is heart warming, although some older readers may find it a little schmaltzy at times. Overall, a fun start to what I hope will be a long running series. 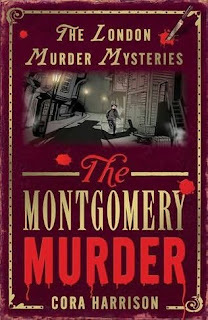 The Montgomery Murder was released back in March and the second in the series, The Deadly Fire, is scheduled for an August release. If you kids like mystery stories with real peril for the main characters then this is certainly worth getting hold of for them. Lazarus Stone is about to turn sixteen when, one night, his normal life is ripped to shreds by a skinless figure drenched in blood. He has a message: The Dead are coming. YA horror is big at the moment, and it seems that nary a month goes by without another one appearing on the market. Vampires, of course, seem to be the nether creature of choice at the moment, but demons (in various guises) aren't trailing too far behind. In the last few years we have been treated to, amongst many others, Darren Shan's Demonata series, Rick Yancey's Monstrumologist and Sarwat Chadda's Devil's Kiss. 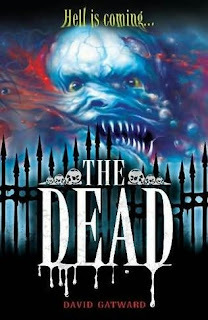 So, when I first read about David Gatward's The Dead, the question that jumped immediately into my brain was does the world really need another YA demon story? I for one am all vampired out at the moment. Thus, when I received a proof copy from the kind people at Hodder, it was with an unsually critical frame of mind that I started reading it. And yet, despite this pessimism, I loved this book. It is difficult not to compare any book in the demon genre with Darren Shan's work, but I am sure that Mr Gatward will be glad to hear that the comparisons in this case are certainly favourable. I love the Demonata series for the gorefest that it is, but Shan has a way of getting away with such extremes, and this is what makes his books special, even though he is not a particularly great writer in the technical sense. The Dead starts off as a conversation between man character Lazarus Stone and his friend Craig and BLAM!.... chapter three hits you right between the eyes with a particularly bloody scene (more about this in a minute). But where Shan lays the gore on pretty thick, this was a much more considered scene. In fact, on a second read it isn't particularly gory at all, but the description of Red as he first appears in Lazarus' life will most definitely make you cringe - I certainly felt a shiver run down my spine. In fact, why not give it a try now by downloading this pdf of Chapter 3 from David Gatward's website! I said I would come back to the description of Red. Anybody who has seen Clive Barker's Hellraiser movie will, I am sure, agree that Mr Gatward has been influenced by a scene from this classic horror film. I love the passage that reads: "Lazarus couldn't yet tell if the thing was male or female, but it was definitely naked, or so he guessed. He couldn't see any clothes, not unless they, like the rest of its body, were covered - no, drenched - in blood. From there on down, the figure was stripped of most of its skin. He could see individual muscles and tendons tensing, relaxing. And around the figure's feet, as they rested together on the floor, a dark pool was spreading". If you are a horror fan and that doesn't persuade you to rush out and buy this book then nothing will. On the basis of Chapter 3 I was expecting the gore factor to increase throughout the book, but I was pleasantly surprised. David Gatward is actually pretty restrained when it comes to writing his horror scenes, but this doesn't mean that the chill factor is anything less than terrifying. There is one scene in particular, where Lazarus is in hospital, that I particularly loved. It is scary, yet there is hardly a drop of blood in sight, and Lazarus' life is certainly in great peril I won't say much more... just watch out for the nurse! This is the kind of horror writing that plays on your mind as it feeds the dark fringes of your imagination, and turns dreams into nightmares without warning. Sadly, this book is not perfect. I have one big criticism - at 230 pages it simply isn't long enough. I know it is the first in the series, and as such it certainly does the job of introducing us to important characters and major plot threads, but in personally felt that it could quite comfortably have benefited from being at least another fifty pages longer. With this is mind, don't expect a nice, neat ending with a few plot threads left unresolved to take you into the next in the series. This book ends on a massive cliffhanger, and very little in the way of loose ends being tied off, and this cause a few readers to grumble. However, what it will do though is leave you hungry for the next instalment, The Dark, scheduled for an October 2010 release. Short-ish books are very difficult to review without giving away too many spoilers, so from now on I will be careful. As a debut novel I also know very little about the author, and I would hate to make assumptions about his inspirations for writing. However, in my opinion there is most definitely a biblical link here - Lazarus' name for a start (and what a great name for a character in a YA horror story it is). Red is also descried as being one of the Fallen, and it looks like we may even be taking a journey into Hell in future books. Although, maybe not, as last time I looked I am not sure there was an alcoholic angel mentioned anywhere in the Good Book? Mr Gatward has very kindly promised to take part in an interview for the Book Zone in the near future, so hopefully we will find out a lot more about him and where he wants his story to go very soon. Watch this space. On the evidence of The Dead, and with the sequel coming out only a few months later, I think David Gatward is going to become a big name in YA horror circles, especially as the cliffhanger ending suggests that we are in for one hell of a ride as we follow Lazarus into the land of the Dead. The Dead is published by Hodder and is scheduled to be released on 1st July. Whilst you are waiting for this date to arrive you could do a lot worse than to check out Mr Gatward's website where you can see the fantastically gruesome book covers for the first three books in the series. I recently posted a review of Death Cloud, the first book in Andrew Lane's new Young Sherlock Holmes series. Thanks to the generous people at Macmillan I have two signed copies of Death Cloud to give away. In order to win a copy of this book all you have to do is follow me on Twitter and add a comment below this post. Please include your Twitter name or an email address with your comment. The first two names drawn at random after the closing date will win a signed copy of the book. Deadline for your comments is 8pm Monday 24th May. This contest is open to UK entrants only. Contest open to UK entrants only. I will not be held responsible for items lost in the mail. I have been a fan of the Sherlock Holmes stories since I was in primary school. My sister and I had piano lessons every Friday evening, and we would walk the two miles from school to our grandparents' house, met half way by Grandad. My sister's always had her lesson first, and then I would race back round the corner to my grandparents' house in order to be sat in front of the TV ready for the weekly Friday night black and white film on BBC2. I saw all kinds of classic films at this young age, including many of the Ealing comedies, but it was the Basil Rathbone Sherlock Holmes movies that I loved the most. And I still love them to this day. Yes, Jeremy Brett's portrayal of the master detective is, I will readily admit, the screen incarnation of Holmes that is truest to the books, but at the age of nine I wasn't to know that the stories had at times been tinkered with a sledgehammer for Rathbone's productions, and nowadays I just don't care. Last Christmas received the boxset of Rathbone's films for Christmas and in my mind they are as good as ever, more so because they led me to reading Conan Doyle's books as I neared my teens. As a child I was obsessed with mystery books. I read and re-read Blyton's Famous Five and Five Find-Outers books, and then progressed onto The Three Investigators and the Hardy Boys. From here it was only natural that I would eventually move onto Agatha Christie and, because of the films, Sherlock Holmes. These days there appears to be a dearth of good detective mystery stories for kids and young adults, although there are several great series that are well worth diving into that I will mention over the next fortnight. 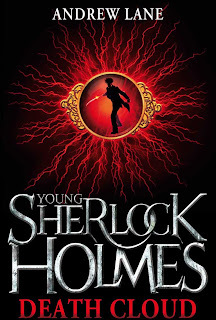 So it was with a huge amount of excitement that last year I read about a new series of books that would focus on Sherlock Holmes' teenage years. It is such an obvious concept for a series of YA books that I am surprised we haven't seen it earlier, especially given that Charlie Higson's Young Bond series has been around for half a decade. Perhaps, as with the Young Bond series, it just needed the right person to come along to write them. I loved this book and I believe that in Andrew Lane we definitely have the right man for the job, as do the estate of Arthur Conan Doyle who have given this series their authorisation. Despite this 'blessing' it is still a massive challenge that he has taken on. There are more than 350 Sherlock Holmes fan clubs around the world, and no doubt there will therefore be a lot of die hard fans who will not warm to this idea, and will possibly be over critical in their discussion on this book, just as they are when any author publishes a book featuring the legendary detective (and believe me, there have been many such books written by a plethora of authors since Conan Doyle died). In my opinion, though, Death Cloud is the perfect way to introduce this character to a new generation of book readers, especially given Holmes' rise in their cultural awareness following the Robert Downey Jr film. Andrew Lane is himself a lifelong fan of Sherlock Holmes, and his passion for the original Conan Doyle stories is apparent throughout the book, which includes many cheeky nods towards the original stories. For example, in Death Cloud the young Sherlock has to go and stay with his Uncle Sherrinford, this name being one that early notes show had been conisdered by Conan Doyle as a possible name for his detective. There are many such references throughout the book, which more uptight older fans may find irritating. Me? I found them a charming addition to the story, many of them bringing a knowing smile to my face. I have already mentioned the Young Bond series, but Mr Lane's task in writing this book was very different from Charlie Higson's. Ian Fleming provided his readers with many details about Bond's youth, and Higson had to be very careful not to upset the fan boys by contraticting the character history created by Fleming. As far as Sherlock Holmes is concerned however, Conan Doyle provided very few details about his character's formative years, thus giving Andrew Lane more chance to use his own imagination in creating a life for the teenage Sherlock. I was very relieved as well that Mr Lane chose not to create a young Dr Watson to accompany the teenage Holmes on his adventures. Much as I love Barry Levinson's 1985 film Young Sherlock Holmes and the Pyramid of Fear, screenwriter Chris Columbus chooses to totally ignore the fact that Conan Doyle has Holmes and Watson meeting for the first time in A Study In Scarlet. Of course, this also means that unlike the original stories, these are not narrated by Watson, and Lane's story is written in the third person. Unlike some other reviewers, I really enjoyed the way Andrew Lane has started to develop the character of Sherlock Holmes. The adult incarnation has an incredibly complex personality, with emotions that change in a flash, going from moments of extreme elation, and then right down to the other end of the emotional scale. This would not work in a book such as this, and some adult reviewers may not have grasped this through their lack of understanding of the teenage book market. In Death Cloud, Andrew Lane presents us with a Holmes that is almost a blank canvas - he is bright and inquisitive, but is yet to develop the cerebral abilities and obsession with detail that see in the adult character. It would be ludicrous expect these in a 14 year-old whose life experiences are pretty much limited to boarding school and a sheltered family life. Another big difference between Death Cloud and Conan Doyle's stories is the level of action. This book has a fast-paced plot with many exciting action scenes involving chases, escapes and a smattering of blood and gore as well. There is also a brilliant climactic fight scene when Holmes has to do battle with the arch-villain of the piece, the gloriously demented, and physically gruesome, Baron Maupertuis. Yes, this character is a little over the top, but I loved him and young minds will send nervous shivers down many a spive as their owners picture this monstrous man. Is this selling out? No - it is providing the 21st Century 11+ reader with exactly what they want in an adventure story that will keep them turning pages. Without a Watson or a Lestrade to keep our hero company on his adventures, Mr Lane has obviously had to create a brand new set of characters. My favourite by far of these is Amyus Crowe, an american gentleman employed by Sherrinford Holmes to tutor Sherlock for the duration of his stay at Holmes Manor, and it is Crowe with whom the author places the task of starting to mould the boy's personality into the adult one fans know well, and again, fans who are able to climb off their high horses will enjoy spotting the moments that allude to the adult character's personality and abilities. Another interesting character is the sinister Mrs Eglantine, Housekeeper at Holmes Manor. She is the thorn in the young Holmes' side, making him feel very unwelcome from the moment he arrives at his relatives' house, but unfortunately I felt that Mr Lane did not lavish as much developmental attention on her as he could have. Perhaps this means we will see more of her in future books, and the mystery surrounding her character will unfold further. Overall I found this a hugely enjoyable read and I am unashamed to say that Mr Lane has created at least one big fan for his new series. My big thanks go to Dominic Kingston at Macmillan for sending me a proof copy to review, and also for his generous offer of some copies of the book to give away on this blog - watch this space for more details. 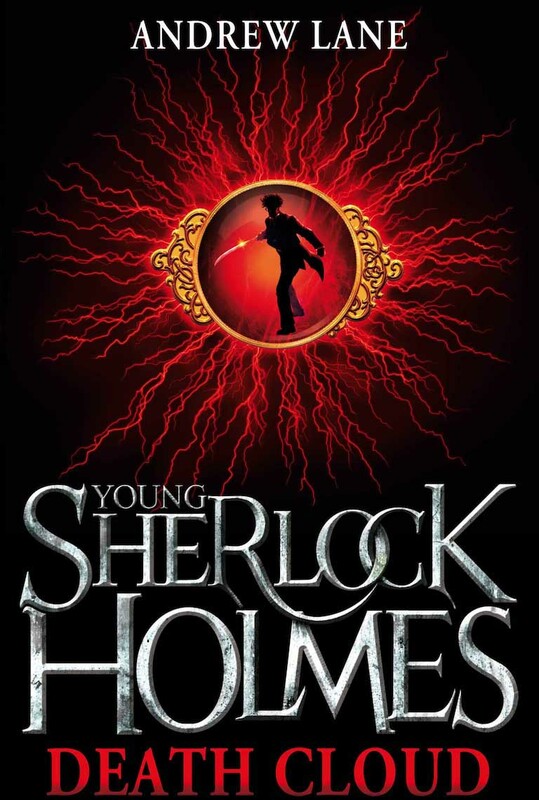 Young Sherlock Holmes: Death Cloud is scheduled to be released on 4th June 2010. Ten years ago Kate Winters’ parents were taken by the High Council’s wardens to help with the country’s war effort. Now the wardens are back...and prisoners, including Kate's uncle Artemis, are taken south on the terrifying Night Train. Kate and her friend Edgar are hunted by a far more dangerous enemy. Silas Dane – the High Council’s most feared man – recognises Kate as one of the Skilled; a rare group of people able to see through the veil between the living and the dead. His spirit was damaged by the High Council’s experiments into the veil, and he’s convinced that Kate can undo the damage and allow him to find peace. The knowledge Kate needs lies within Wintercraft – a book thought to be hidden deep beneath the graveyard city of Fume. But the Night of Souls, when the veil between life and death is at its thinnest, is just days away and the High Council have their own sinister plans for Kate and Wintercraft. It is a rare thing for me to be excited about reading a YA fantasy story. I am not a huge fantasy fan, and with so many books in this genre being the first in a trilogy or series I generally let them pass me by. It's not as if I am short of reading matter after all. However, there has been a lot of talk about this book in the run-up to its 13th May publication date, and a friend had assured me that not only was it brilliant, but it could also be read as a stand-alone, and so it was with some anticipation that I started reading it. So.... should you believe the hype? Hell yes! 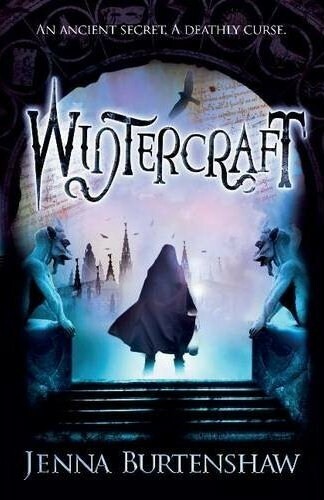 Jenna Burtenshaw's debut novel Wintercraft is a dark fantasy story that I just didn't want to end. It follows the adventures of Kate Winters, a reluctant heroine who has lived with her Uncle Artemis, ever since the wardens took away her parents and many of their fellow townspeople in order to aid the war effort. 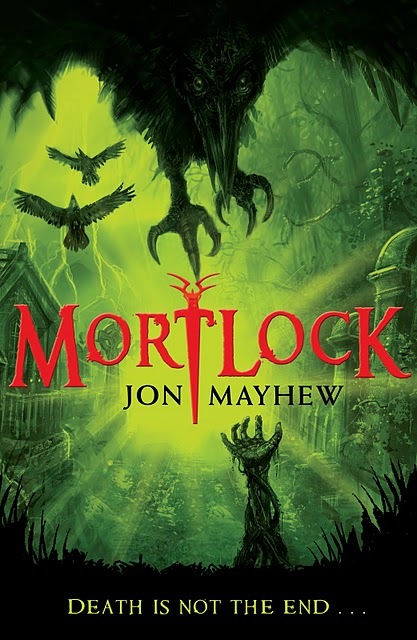 Morvane has been spared the wardens' attention for a decade, but now they are back and as they descend on the town Kate discovers that she has a strange and frightening power which allows her to bring the dead back to life. Kate's voyage of discovery takes her across Albion, from Morvane to the distant city of Fume, once the country's burial city but now the domain of the High Council. The world she travels through is well-developed by Ms Burtenshaw, and in a manner devoid of the lengthy (and often unnecessary) descriptions that generally turm me off fantasy novels. She makes every word count as she builds the world, and I am more than happy not knowing more details about Albion such as what the landscape is like between Morvane and Fume. When descriptive writing is required it is full of detail, and I found it very easy to create mind pictures of places such as the City Below and the bonemen's ancient library (I would love a library like this). In less than 280 pages the author also manages to create a plethora of exciting characters, both good and bad (and possibly inbetween the two). My favourite character by far was the cruel Silas Dane. This man has been tireless in his hunt for the Wintercraft, a centuries old book that is purported to contain details on communing and resurrecting the dead, and other such abilities enjoyed by the mysterious Skilled. A puppet of the depraved Da'ru, this man, a cold-blooded killer, is the Darth Vader of Wintercraft - a man so cruel and seemingly devoid of emotion that you just so want to hate him, and yet.......... And like Darth Vader being the real star of the Star Wars saga, Silas Kane is the stand out creation in this story. Boys, don't you dare not read this book because it has a female main character. You will happily play Tombraider games, yet last time I looked Lara Croft was most definitely female, so give this book the same degree of respect. I can assure you there are no icky romantic moments in this one, and there are some pretty scary moments to keep horror fans smiling. As I said before, this book can be read as a stand-alone. However, whilst bringing the story to a natural conclusion, Ms Burtenshaw has also left the door ajar ready for a further journey into Albion, and I am sure we will see more of Kate Winters and Silas Dane. Wintercraft is published by Headline, and is due to be released on 13th May, and I am very grateful to the people at Headline for sending me a copy of this book, and thereby introducing me to the world of Wintercaft. I want a pint of whatever Mark Walden is drinking! Where other authors struggle to maintain consistently high quality across a series (yes, I'm talking to you Messrs Higson, Hororwitz and Muchamore), Mark Walden has managed to produce yet another superb action adventure story that yet again has this series crying out to be transferred to the big screen. Rogue is the fifth, and I gather penultimate, instalment in the H.I.V.E. series and again Mr Walden demonstrates that he is not short of original ideas. 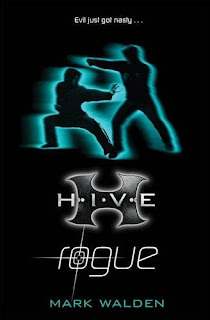 The first book in the H.I.V.E series was published back in 2006, with the following two books (The Overlord Protocol and Escape Velocity) continuing the story arc to what seemed like a natural conclusion, but left fans clamouring for more. Mr Walden duly delivered by creating a new plot for his characters, with new challenges and enemies, and with Rogue he has set us up for a fantastic series finale, by revealing many answers but leaving enough loose ends to have his readers waiting excitedly for book six, entitled Zero Hour and due out in September. If you have read any of the H.I.V.E. books to date then you will know exactly what I am talking about, and no doubt will already have a copy of Rogue, which was released on 3rd May. If you have not yet discovered this series then where have you been hiding for the past four years? Find a dictionary, look up the word 'unputdownable', and you will see the statement "see H.I.V.E. series by Mark Walden". 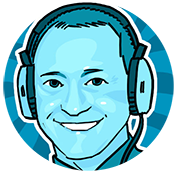 Mark Walden likes his acronyms - H.I.V.E. stands for Higher Institute of Villainous Education, the training section for G.L.O.V.E. (Global League of Villainous Enterprises), and the stories follow the adventures of students Otto Malpense, Wing Fanchu, Laura Brand and Shelby Trinity. Without giving too much away, Otto did not manage to make it back to H.I.V.E. at the conclusion of Dreadnought, and Rogue focuses on his friends' attempts to locate and rescue him from the clutches of H.O.P.E. (yes, another acronym, this time standing for Hostile Operative Prosecution Executive). However, the task is not a simple one; Otto has a very unique talent and it would appear that H.O.P.E. have somehow managed to harness his abilities to target and destroy members of the G.L.O.V.E. ruling council, resulting in a capture or kill order with Otto's name on it. The H.I.V.E. books are consistently brilliant, perfectly paced stories full of edge-of-your-seat action sequences, sparkling humour and great dialogue and banter. There are more gadgets than you would find in a handful of Bond films, villains with mile-wide evil streaks who will not flinch at killing any of the young students if it suits their dastardly plans, and chase and action scenes equal to many that we see in Hollywood blockbuster movies. I have not yet met a 12 year old boy who didn't love reading one of these books. Rogue was published by Bloomsbury on 3rd May, and Zero Hour, the final(?) book in the series, is currently scheduled for a 6th September 2010 release. My thanks to Bloomsbury for sending me a copy. Well done and thank you to everyone who entered. I will now endeavour to contact the winner through twitter. Please reply within 48 hours or I will draw another name out of the hat. Many thanks to Bloomsbury for providing this fabulous prize. Unfortunately I don't always have the time to read and review every book that comes my way. I know I am incredibly lucky in this respect, and it is nice to be able to 'share the wealth' so to speak. Back in February a new kid appeared on the blogosphere block. Ryan Woods runs the Empire of Books blog, and is well worth visiting. He has been a little quiet of late due to a house move but hopefully we will hear more from him now things have settled a little. 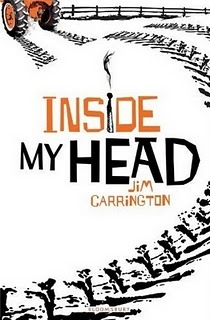 Thanks Ryan for this great review of Inside My Head by Jim Carrington. Inside My Head by Jim Carrington is probably one of the most thought provoking and compelling books I have read for a long time. Mr. Carrington obviously knows his stuff, because this book is utterly believable. He tackles bullying in a way that I haven’t seen in literature before. And it is so perfectly written that you actually feel the sting of every taunt. The four main characters are Gary, Knaggs (although not once in the book does Knaggs narrate, possibly my only negative point about the book), David and Zoe. All of which you find yourselves relating to at times, which is interesting. It isn’t very often you relate to all of the main protagonists in a book, which makes this book all the more appealing. I myself am the son of a (albeit now ex) farmer, and in primary school, a few of the kids found it funny. “Haha! Farmer boy! Been out in your tractor lately? Got a brand new combine harvester and I’ll give you the keys!” But also I relate to him in the sense that everyone has had nasty things said to them. Sometimes just a few little names. But sometimes it goes a lot deeper. And for Gary, this feels pretty deep. I also relate to Knaggs in a strange way. And kind of in an embarrassing way. Everyone at some time or another has been on the other side of name calling and taunting. Handing them out. When in a group of friends, you feel big and clever, later realising that it wasn’t such a good idea, while Knaggs doesn’t really seem to feel any guilt for the hurt he causes. That, I don’t relate to! But also David. He’s Knaggs right hand man. And feels a loyalty to Knaggs, but knowing he has done wrong, he feels the need to be honest, and tell someone that this isn’t right. And I’m sure we’ve all been in this situation with our own friends or relatives, and suffer a moral quandary. Is it right to dob on a mate? No matter what the cost to your relationship, or do you just forget about it, despite the wounded party who is really suffering in all this? And then there’s Zoe. She’s moved from London to the middle of nowhere in Norfolk. She feels completely out of her comfort zone. This I relate to strongly, because for me, it’s an ongoing saga, having moved just over a month ago, but in the opposite way to Zoe. We moved from a house in the country (Norfolk, no less, where the book is set) where our nearest neighbour was a minute's car journey up the road, to a mid-terrace house, in a little street with houses on all sides, and situated in the middle of a small town. Not a big fan, to be honest, so I know exactly how Zoe feels. What I love about the book is the way that the narrative is used. You get to see it from all view points. The person being bullied – Gary. The bystander watching – David. And the person on the outside wanting to help – Zoe. And Carrington used the Norfolk landscape brilliantly. And it just proves that bullying is just as rife in small communities, as it is in larger ones, in the cities. Inside My Head is completely and utterly unputdownable. From start to finish I was gripped so tight it was unreal. The writing is compelling, and dare I say it, addictive. A real book lover's books. I highly recommend this to readers young and old, male and female, of any generation. And for a debut book, it is of stunning quality. Some author's debuts are good, but lack a certain something. This is something that Mr. Carrington doesn’t need to worry. Definitely one to watch in the future! - I’d just like to say thank you to The Book Zone for giving me the opportunity to read and review this! I am so grateful! And a big thank you from me to Ryan for this great review. Bullying is an issue that every young person worries about (yes, even the bullies themselves) and books like this are very important. In fact, I would go as far as to say that there should be a copy of this book in every secondary school library. Inside My Head is published by Bloomsbury and is in stores now. It's a difficult time for fifteen-year-old Savannah Grey - she's settled into her latest foster placement, but her body is acting strangely. Then other strange things begin to happen: nature, it seems, is exerting an overpowering force on the world. Birds behave erratically; gusts of wind blow leaves so fiercely they seem to lure people away. And Savannah discovers she has supernatural powers. Meanwhile, she feels drawn to the new boy Reece whose life is even stranger than hers. Quickly Savannah and Reece realise that nature has a purpose for them both. For they are on course to meet the vile and evil Ocrassa, who wants to destroy the world by corrupting nature. And it wants Savannah Grey to help realise its savage intent. Why do publishers do this? On the front cover of Savannah Grey are the words "A monster's out there. Only one girl can stop it. But will love get in the way?" Cool, there is a monster. Only a girl can stop it? You have just lost a number of boy readers. But will love get in the way? OK, that's the majority of your remaining boy readers reaching for their PS3/X-Box/game console of choice. There has been much discussion on The Book Zone and elsewhere as to why boys don't like female main characters, and one argument put across is that it is not actually female main characters that put them off, but instead a pre-conceived idea that such books may be a little heavy on the romance. From experience, I know that one sentence on this book's front cover will seal its fate as far as boy readers are concerned, and if I'm totally honest I nearly didn't read it myself. However, I decided to skim read the first few pages and very soon I was completely captivated by Cliff McNish's haunting and powerful prose. "Reaching number thity-three, Savannah Grey's house, the Horror dropped its star-shaped head on one side, knotted its murderous claws behind its back and tried to work out the most entertaining way to reach her bedroom. There were many ways available, but the Horror was young and like all young things it liked to use its teeth." The other two monsters in the story are the chameleon-like Nyktomorph and the alien Ocrassa, a parasitic entity that arrived on earth as a tiny seedling having spent millions of years travelling across the universe. The Ocrassa is the perfect organism, able to adapt to its surroundings, modifying its anatomy and abilities by adopting those of other organisms it encounters. It is also able to create other organisms, the Nyktomorph and the Horror being two such examples. The Ocrassa is on a quest to become the dominant life form on earth and ultimately have the ability to master genetic engineering and create copies of itself, and send billions of seed-pods floating trhough the universe. However, there is one huge hurdle standing in the of the Ocrassa'a goal - Mother Nature herself. At regular intervals throughout the book Cliff McNish provides his readers with a little back story, in this case a history of the planet Earth and its organisms, and how Nature has created many of these in its endless war against the Ocrassa. Evolution, therefore, becomes Nature's weapon in this war. Throughout time Nature and the Ocrassa engage in a tug-of-war, with varying degrees of success for both parties. However, when Nature finally presents its enemy with Man the Ocrassa realises that this could become the tool it has long required to master the science of genetics, and instead of fighting it changes tactics, and fosters creativity, innovation scientific advancement across the ages. Although exceedingly creepy, and occasionally gruesome, Savannah Grey does not contain the levels of gore that we have seen in many YA and kids' horror books, and it is all the better for this. Cliff McNish uses dramatic tension, and fear of the unknown to hook his readers. Savannah is a very believeable heroine, and we share her feelings of confusion and terror as she gradually deduces that she is more than just a normal girl, but is instead some kind of weapon created by nature to defeat an as yet unidentified foe. Boys, please don't judge this book by its cover. If you like intelligent, creepy horror stories, or science fiction with an undercurrent of terror, then you just may love Savannah Grey. Yes, it has an important romantic element to its plot, but it does not come with all the girly frills that may detract from other stories in this genre. I have really enjoyed horror month and I feel that this is the most exciting genre in kids' and YA fiction at the moment. Having been ill earlier in the month I didn't quite manage to read as much as I wanted to there is still the review of horror story Savannah Grey by Cliff McNish to come in the next couple of days.